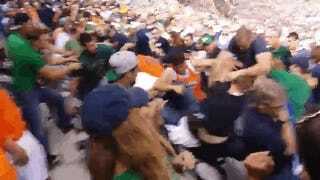 A brawl broke out in the stands at Saturday's Notre Dame-Syracuse football game. Why? Who knows. Anyway, at about the :40 mark, one man took a few punches, then popped up and knocked another guy over with one swing.